The thrilling instalment of an underrated series. This is the latest instalment of the underrated Mission: Impossible series of action films. The first one was a refreshing thriller that came out mid 90s when every other movie was a cheap action flick. The second one, by John Woo, is not very good but at least oozes with style and boasts a Zimmer soundtrack. The third is an outstanding action movie that brings on the intensity. Now this 4th one, Ghost Protocol (because every movie now needs a subtitle, despite none of the previous films having one) amps up the action and brings the thrills. This film brings the great and mighty Brad Bird on to direct, and his experience in animation brings a level of perfectionism and physical type of story telling with his craft. The action scenes (which are the main attraction here) sizzle with a slick combination of coolness with humour. The opening jail break scene is fun. The obligatory heist scene (in Russia) is clever and inventive. 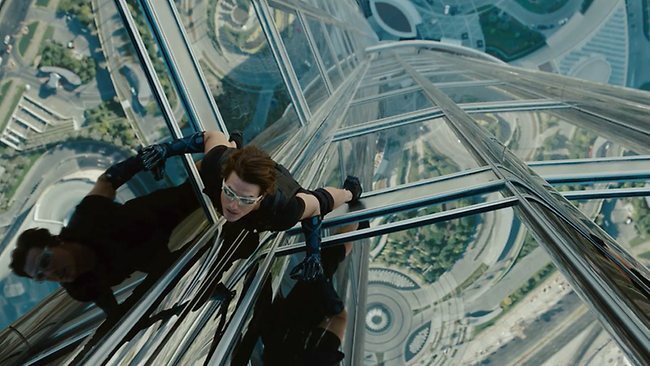 The Dubai scene is insanely thrilling; this is the grandest and coolest scene of the year. And the final fight is somewhat anticlimactic yet incredibly tense. This movies runs at a break-neck speed. So you will definitely get your thrills and action. There is a key difference between this one and the previous instalments. The spotlight is taken off of Ethan Hunt and shone on his teammates. His 3 colleagues are given ample screentime to widen the spectrum of personalities. In particular, Simon Pegg’s Benji is granted the coveted bumbling comedic presence which lightens the entire film. This difference however, of taking the spotlight away from Cruise, is where the film doesn’t work as well as it could. What made the 3rd film so amazing was the through-line which linked all of the events together emotionally. Ethan Hunt was constantly struggling to protect his personal life from the villain, Philip Seymour Hoffman, who was far and away better than the new terrible ‘villain’. But I suppose these films aren’t out to drive home the emotions. They are popcorn flicks designed to entertain and thrill; which Ghost Protocol does extravagantly.